If you’re not up for an overnight trek, the Canopy Walkway and Teresek Hill viewpoint can be walked in a day and make for an easy introduction to Taman Negara. Browse places to stay in Taman Negara on Agoda.com. Free cancellation. The walkway through the park to the canopy walk is not too strenuous but there are a few oddly placed steps and massive protruding roots, so do watch your way. At over 400 metres long, the Canopy Walkway allows you to experience the forest canopy up close and enjoy a bird’s eye view over the surrounds. It is comprised of a series of rope bridges between the trees, each with its own vantage point. Being the most accessible attraction in the park, things can get very crowded - especially with schoolkids on weekends, so do pack some patience or plan to get there in the early morning or late afternoon. The crowds do ebb and flow though, so if it is a madhouse when you show up, continue onto Teresek Hill, the closest viewpoint to here, and circle back later. Or just wait for the crowds to thin. It takes a solid 45-minutes to get to the Canopy Walkway, from the Rangers’ office and slightly less if taking the short cut through the budget chalets. It is recommended to wear proper footwear (not flip flops) and bring along some water. 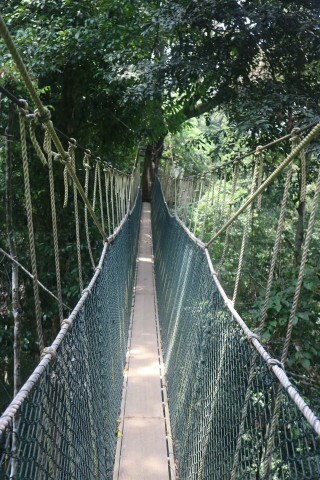 The Canopy Walkway is open daily from 09:00 until 15:00, with exception of Friday being a half-day. No guide is required, the entry fee is five ringgit and a camera permit is an additional five ringgit. Toilets and cold drinks are available.